Consumer advocate Erin Brockovich, who famously took on Pacific Gas & Electric Co. in the 1990s, stands with wildfire victims and speaks outside the state Capitol in Sacramento, Calif., Jan. 22, 2019. Consumer activist Erin Brockovich, who famously took on Pacific Gas & Electric Co. in the 1990s, urged California lawmakers Tuesday not to let the utility go bankrupt because it could mean less money for wildfire victims. 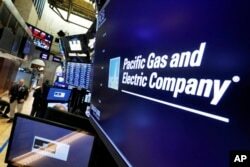 FILE - The logo for Pacific Gas & Electric Co. appears above a trading post on the floor of the New York Stock Exchange, Jan. 14, 2019. Evans also suggested a PG&E bankruptcy could threaten electric service to the utility's millions of Northern California customers. But Governor Gavin Newsom has said the state is not at risk of power shutoffs as it was during PG&E's 2001 bankruptcy amid the state's energy crisis.